On the Right Track | All Around Dogs On the Right Track | Thoughts on training and life with dogs. In dog sports, Tracking is the exercise of following a particular human’s scent and identifying scented items (articles) the human (tracklayer) has handled and left behind as they walked the trail. The end goal is that the dog differentiates between other scents and the tracklayer’s scent and successfully follows the tracklayer’s trail. 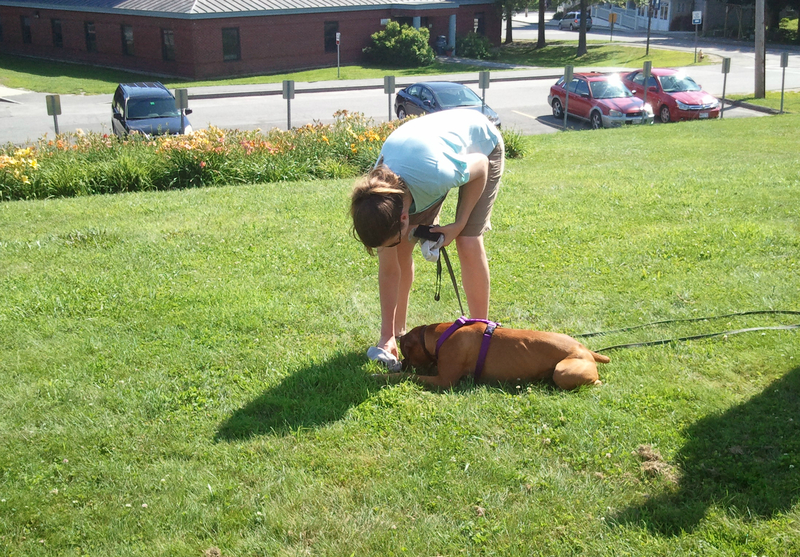 The dog also must “indicate” each scent article on the trail so the handler can retrieve it. The two major venues in my area are AKC and IPO (formerly known as Schutzhund). Both venues have the same basic end goal and require tracks that are several hundred yards long for their first level titles. AKC tracking has the dog follow the trail using the style of scenting s/he naturally prefers – either air scenting or ground scenting. There is some leeway as to how far off the track they can move without penalty. The articles are a variety of commonplace items, such as gloves, bandanas, plastic lids, and the like. One “start” article is placed at the beginning of the trail, which is picked up and can be used to reinforce the scent on the track. Talking to your dog, repeating your command, and praise on the track is allowed. IPO tracking has the dog follow each footstep and requires head-down scenting. Teams are penalized for any straying off the track and/or heads up work. The articles are 1”x4” pieces of leather, fabric, and wood which are neutral colors that blend easily with most ground cover. The track starts with a “scent pad,” which is a stamped or scuffed area that creates a strong collection of scent. You may praise your dog at articles and give them the search command to resume tracking after you’ve retrieved an article, but talking is prohibited on the rest of the track. Such as with other dog sports, different trainers have their own approach or variation on training to the required tasks. The methods described below are specific to the individual trainers I worked with, not to their chosen venues as a whole. This past summer and fall, I had the good fortune of working with both an AKC and an IPO trainer to begin learning the sport. Delta and I had attended a one-day seminar in the summer of 2012, so I knew that she would be a willing participant in the game. Both trainers used food, so I knew I’d be able to leverage her strong food drive as well. Our equipment for both trainers started out the same – a harness, a 6’ leash, and tasty rewards. But that is where the similarities ended. The AKC trainer started out laying relatively short tracks, probably 40-50 yards long. He put down 4 or more articles with one wide (greater than 90º angle) corner and the tracks were aged 20-45 minutes. I would lead Delta to the start of the track, give her the search command, and follow at a short distance. Delta set the pace, within reason, and she was able to go a fair distance off-track at the corners. At each article, I taught her to lie down so I could praise her and give her a food reward. The process was very organic. The trainer would change one or two variables in a new track, depending on Delta’s progress in previous sessions. The variables could be track length, track age, number of corners, angle of corners, or number of articles. After several sessions, he also had me use a longer (10-15’) line to give Delta more room to work. The emphasis for the AKC trainer was that I learn my dog’s body language – She was heads-down with her tail above mid-level and moving slightly when she was on the track. When she was casting (searching) for the scent, she tended move in circles with her head up and she typically did this when she had not immediately turned at a corner. When she was not on the scent at all, her head and tail were mid-level. I was lucky enough to only see this once, when I brought her out on an 85 degree day and she was not comfortable working at that temperature. She lay down in the shade shortly after her posture changed, clearly signaling that working in the heat was asking too much. Delta is rewarded for laying down at a scent article. Outside of sessions with the AKC trainer, my homework was limited to practicing downs at articles and laying very short tracks of my own scent in my backyard. Running my own scent in a small space was not considered ideal, but still helpful in the early stages. By the time the heat became an issue, I was working with the IPO trainer, so I switched to doing his shorter duration IPO exercises for the remainder of the hot weather. In contrast to the first trainer, the IPO trainer’s style was very deliberate and the progression was regimented. In three months of fairly regular training, we went from scent pads to “puppy circles” to very short (20 step) tracks. We stayed at the first two steps for over a month each and had just reached the third step when the light change and my schedule significantly slowed our progress. First, I learned how to work the scent pad. I would scuffed an approximately 2’x2’ area of grass and generously bait it with high value food. Without giving it time to age, I would lead Delta to the pad and give her the “such” command once. When she picked her head up or had nearly finished the food, I would end the exercise by pulling her off the pad. Pulling her off if she looked up was to teach the head-down habit – pulling her off before she finished the food ensured that we always ended with her wanting more. When she was reliably staying head-down on the scent pad under moderate distraction, we were allowed to progress to “puppy circles”. These were actually U-shaped tracks where each footstep was baited with food – in the early stages, there was food at both the toe and the heel to encourage Delta to move directly from the toe of one step to the heel of the next. Unlike the strict control of the scent pad, this stage was about letting the dog problem solve solo. Delta was put on a long line, given the “such” command and then allowed to work with the line dropped and dragging behind her. I was instructed to leave her alone until she showed she was finished working the scent, no matter how long that took. In contrast to the more formal stages we worked before and after, during this stage she was allowed to step off the track, go backwards, and even pick her head up. The goal was to let her figure out what to do all on her own. I knew she was done when her posture and intensity changed from “searching” to “wandering” (the difference is hard for me to describe, but easy to see). When we moved up to short, straight-line tracks, we returned to using strict rules and the IPO trainer started working with her directly. I did not lay or run the short tracks because the IPO trainer wanted to be sure she wasn’t given an opportunity to go off track or turn around, which requires handling skills I don’t have (yet). When he is confident that Delta’s learning has progressed and I’ve had a chance to learn the handling through observation, we will switch back to having me lay and run the tracks. I did the previous two exercises on a harness because it kept the leash out of Delta’s way, but when she began moving forward for the short tracks, we switched to the collar to give my trainer (and later, me) control of her head. IPO’s first level title requires the handler lay their own track and the exercises the IPO trainer uses can fit into the average lawn, so I was given homework for each one. For the scent pad, I worked her on a pad once or twice a day at mealtimes. For puppy circles, I set up circle tracks as many days a week as I was able, being sure to lay tracks that went both to the left and to the right. When we moved to straight line tracks, I went back to doing scent pads but began using the collar in place of her harness. In the end, Delta enjoys the game no matter which way we are training it. I have developed an appreciation for both styles – there is something freeing about letting Delta lead and trusting her when I work with the AKC trainer, and the strict constraints of my IPO trainer’s style appeals to my more regimented inclinations. With a little bit of luck and a lot more training, someday Delta and I will compete in both venues. Until then, I am lucky to have two excellent trainers to help me and Delta learn the ropes.